ZIMBABWE -Zapu president Dumiso Dabengwa has revealed that he warned President Robert Mugabe to step down almost a decade ago but he allegedly threw caution to the wind. Speaking in an interview yesterday, Dabengwa said the current ugly factional fights devouring the governing party were signalling the end of an era. The soft-spoken war veteran — who walked out of Zanu PF in disgust in 2008 to revive Zapu — said Mugabe was a victim of his own arrogance. “It has come to that extent that it’s clear that Mugabe has completely lost control of his warring party,” Dabengwa said. “This is what some of us tried to warn the president (Mugabe) about way back in 2007 that this is the best time for you to step down and allow for any other person in Zanu PF to take over. The Zapu leader claimed it was one of the reasons he was forced to abandon the governing party. He attributed Mugabe’s continued stay in power to “bad influence” from some senior Zanu PF hardliners who thrive on his presence as the president. Dabengwa said he felt sorry for the nonagenarian, averring that he has no legacy to leave behind despite his role in the liberation struggle as well as President of Zimbabwe. control whatsoever and that’s sad for somebody like him,” the former Home Affairs minister said. Dabengwa — who last weekend was forced to call an emergency Zipra meeting following the battering of war veterans by police, prompting an apology from Mugabe — described the presidential act of contrition as bizarre. “It’s very strange, it is the first time I have heard him say that. He has not made an apology on anything; maybe again it’s the issue of age that has taken its toll. 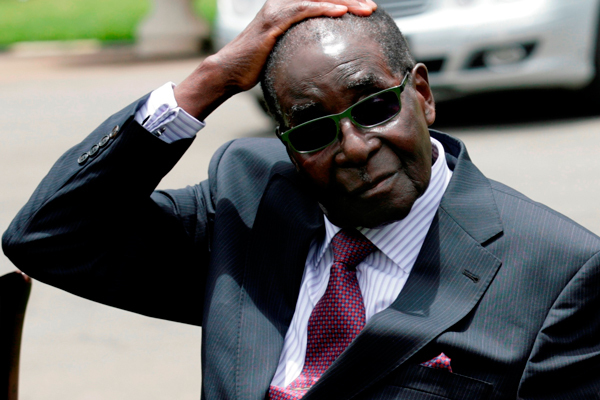 Mugabe has never apologised for anything in his whole life,” said Dabengwa, pointing to a number of cases of gruesome State-sponsored violence against Zimbabwean nationals. The Zapu leader said during his meeting with the ex-Zipra forces, they agreed that they need to be on the lookout for a possible civil war.